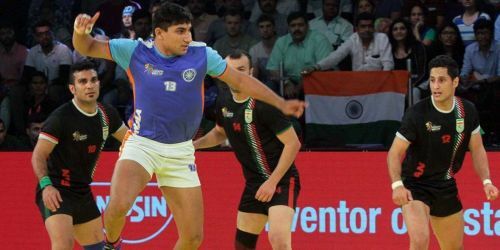 For three years now, the Pro Kabaddi League has given rise to a galaxy of stars who have gone on to represent various franchises through the five seasons. When the first season was announced in 2014, there was a sense of anticipation in the air. The tournament drew a lot of attention toward the sport and finally talented players from all across the globe were now being recognised. Not only did the players get attention, it gave hope to the budding talents in the villages of India where the young prospects hone their skills. Over time, there have been some fabulous raiders who stole the limelight through the performances that they have put in throughout matches. Rahul Chaudhari has been the poster boy of the Telugu Titans, while a calm and influential Anup Kumar has led U-Mumba to the title amongst the huge list. In light of the upcoming season, we try to pick ten top raiders who have made a major mark in the Pro Kabaddi League so far. The talented raider made headlines recently when he broke the record for emerging as the costliest buy in PKL history, bought for 93 lakhs by U.P Yoddha, who went all-out to secure the services of the Navyman. Tomar first shot into limelight when he got 77 raid points under his belt in season 3 while playing for the Bengal Warriors which was enough to earn him a spot in the Indian National team for the World Cup in 2016. In season 5, Tomar will be representing the Yoddha and will hope to repay the faith entrusted to him by the team.